Amazon AR View – Seeing Is Believing! I groaned at the thought of getting out of bed, but needing to see what this feature was, I obliged (I just did it the easier way). I asked Alexa to, “turn on my master bedroom light”. Lights came on, and my phone told me to pick a flat surface. I did just that and a blue dot came up. I clicked on the blue dot and BAM! The infant toy was sitting on my hardwood floor! Just like that. Who knew your phone could put toys all over your floor just like your kid? Since I am a digital marketer and have been running campaigns on Amazon for years now, I went ahead and spent most of the night researching the feature I had just seen. It works for many electronics, furniture and other home items, as well as lots of baby and toddler toys. Need to know if that new kitchen appliance will fit? Test it out. I wish it worked for strollers, as I’d love to see the actual size before making the purchase (measuring tape is for whimps). The trouble with all my research, is that I only turned up alot of consumer-facing information on how to use Amazon’s AR View. If you have a fancy enough smartphone and have installed the Amazon App on Android or iOS, you can open it and try clicking the camera. From here, there will be different options at the bottom, in a slider format (options like scan barcode). 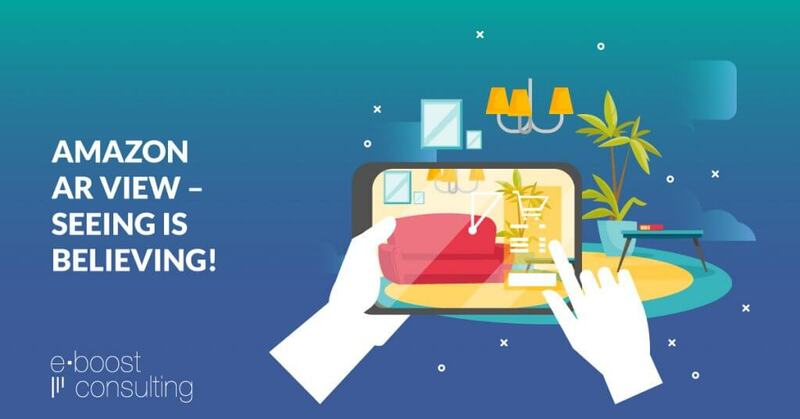 Scroll through to the AR View, which is the last option and you’ll see categories of items you can chose from, each with their own products you can test out in your home. Once you click on a product, you are prompted to find a flat surface and click the blue dot, which will make the item appear in the given spot. You can also move the item with your fingers to ensure it is placed properly. It truly is a 3D experience, and you can move your phone around the item as it stays in place. Everything I’ve tested looks fantastic! This will be a huge win for furniture and home improvement retailers. Check out the shots below. That table does not exist (IRL), and neither does that chair! The trouble with all my research though, is that I haven’t cracked the code with how advertisers can leverage this technology, and it seems that it is only a “buyer feature” at the moment. While Shopify and other feed developers give the option to create 3D product images, we are unsure if doing so automatically makes those images available in Amazon, however it will likely play out that way down the line. The uncertainty here shouldn’t stop any of us though! We’re going to continue to dive into research to learn if it’s possible to add this feature to our products being advertised through Amazon Seller Central. As always, we want to be bringing our clients the latest and greatest, so we’ll be keeping an eye on this technology, just like we’ve been doing for Facebook’s 3D posts. Are you an advertiser looking to use Amazon’s AR View? Let’s connect, and we’ll power through this one together! 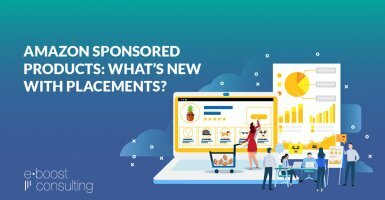 Amazon Sponsored Products: What’s New with Placements? Google Ads Competitor Campaigns – Do or Don’t? Facebook Introduces Square Images for Link Ads – Advertisers Rejoice! eBoost Consulting helps great companies grow through search and social paid advertising. Since 2005 our team of digital marketing experts has been running highly successful digital marketing campaigns with a focus on innovation, results and customer satisfaction. ©2018 eBoost Consulting. All Rights Reserved.